Regular readers will know that I like riding pedal-powered machines (conventional bikes, folding bikes and recumbent trikes) and that I very often ride at night. However, in technology nothing stays the same and so about a year ago I started closely checking out the new wave of LED headlights designed primarily for mountain bike use. Living near Canberra, perhaps the Australian home of serious mountain bikers, I soon discovered shops selling LED lighting systems costing anywhere up to AUD$500. These typically used multiple 3W and 5W LEDs, lithium battery packs and trick circuitry to maintain light brightness and protect the batteries from full discharge. Different flash and power modes are also available. In the shop these lights looked excellent, and attending a 24 hour mountain bike race showed how effective these top-line lights are in real-world conditions. So I decided to take a punt on eBay, buying a light that uses three Cree LEDs in a cast alloy housing, a lithium-ion battery pack and a dedicated charger. All for about AUD$100 delivered. First impressions were very favourable, and I mounted the light permanently on my Brompton. Riding out into country south-central New South Wales, where the roads have no lighting and quite often there’s no moonlight as well, I found the light excellent in reach, spread and beam pattern. In fact, have the headlight aimed even fractionally high and on these country roads oncoming drivers kept flashing their headlights at me! But then things started going downhill. Firstly, I was out at night, and a fair way from home, when the light extinguished itself. No warning, no reduction in power – just from full brilliance to off. Luckily I also run a light on my helmet so I could turn that on and get home. The problem? The battery voltage was low and when this happens, the light simply switches off. OK, so charge the battery up again and monitor how many hours of light are available – about 3 hours in fact. But then a few weeks later I found the same problem occurred – great light then, bang, nothing. And the ‘run’ time was getting shorter and shorter. On that occasion I found the AA cells in my helmet-mounted light were also getting low, and in addition to the darkness, there was fog. It was a dangerous ride home. During this time I was running a rear Cateye red flasher, in fact a AUD$50 tail-light with six large, high intensity LEDs. It’s a good tail-light but it has a problem common to many: it’s quite directional and so if not mounted exactly right, visibility to car drivers falls off rapidly. Plus, despite having eight different flash modes, none was all that effective. I have a bunch of 12V Sealed Lead Acid batteries I’ve previously salvaged from discarded uninterruptible PC power supplies, and a home-made battery charger detailed here. I added the Pulser module and used simple ceramic resistors to regulate the LED currents. I then added a diode and a handlebar-mounted switch so that I could easily operate the headlight in flashing or steady modes. The Pulser is set for a 3Hz flash rate with 12 per cent duty cycle. It’s a relatively simple system that is also heavier than the professional approaches. But it’s also a system that has heaps of duration (something like 5 hours should be easily achieved, night after night if necessary), provides better overall safety than the previous system, and cost me nothing much to make. It also shows, by the very simple indicator of declining light output, when it needs to be recharged. Kinda back to the future – something that on paper looks inferior but for me, works far better. I did an automotive electronic installation the other day. It’s a particular job I have done many times before – installing driving lights on a vehicle – but I came across a problem I’ve never before experienced. After bolting a pair of Narva 175 driving lights onto the front of my wife’s Skoda Roomster, I decided to buy another pair for my own car. Simply, considering the cost of the Narvas, I was very impressed with the quality of the illumination upgrade on the Skoda. In addition to a relay, switch and terminals, the Narva package contains both wide and narrow beam lights; I found the effective combination of spread and penetration makes a huge difference to night-time driving safety. And not just safety – I’ve done a few long distance drives in the Narva-equipped Skoda and it’s a lot les fatiguing driving with good lights. On my Honda the installation was always going to be relatively difficult. As with many cars, the Insight has no real mounting spots for additional lights. The approach taken by many – install an adaptor held in place with the number plate screws – didn’t do a lot for me so I searched on the car for places where brackets could be mounted. In the end I welded together a square tube assembly that sits just in front of the radiator but behind the bumper, held in place with welded-in spacers and bolts that pass through original sheet metal holes. The lights themselves mount on 10mm threaded rod through thick flat steel brackets brazed to the square cross-tube. I also took some pains with the wiring, choosing not to use the relatively thin wire provided with the kit. Instead I ran thick, dual-core cable from each of the lights back to the Narva-supplied relay that I mounted on a new bracket located close to the battery. I added a 20 amp blade fuse in a holder and triggered the relay from the high beam headlights. Being a slow worker and taking my time, it took about a full day. That night, I went out to aim the lights. Driving around the country town in which I live there are plenty of dark streets and country roads to use – things were going smoothly until I suddenly found a major problem. After the driving lights had been switched on for a few minutes, they wouldn’t turn off! I had to actually pull over, lift the bonnet and physically tap the relay to get the lights to extinguish. That made me unpopular with oncoming traffic and so after this had occurred a few times I gave it up and went home. The next day I measured the voltage across the relay’s coil’s contacts. Relays disengage at a much lower voltage than they pull-in (for example, a 12V nominal relay might not disengage until the voltage has dropped to 3V) and I wondered if there was a residual voltage keeping the relay engaged. However, a check showed that while there was a voltage on the wire (even with the high beams off), it amounted to only 0.3V – and any 12V relay should be turned off at only 0.3V! So what was going on? 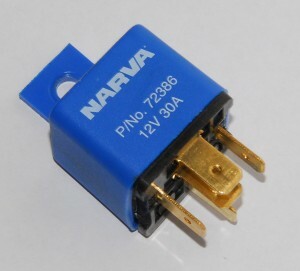 I swapped the Narva relay for another relay I had in my spare parts drawer and the new relay operated without any sticking problems. 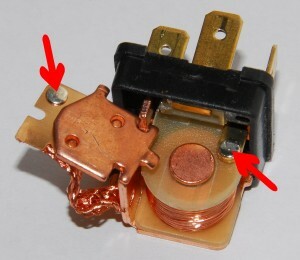 So the original relay was the issue. I then pulled open the Narva relay to find that, on the contacts, there was a tiny but obvious burn mark (arrowed). The relay contacts, despite being quite large in area (as befits a 30 amp relay) were in fact touching at only a tiny spot. The contacts were literally welding themselves together!